Over 70 thousand people from Israel and all around the world participated in the exciting and moving event of Birkat Kohanim – the priestly blessing for the masses in the two morning prayers. Among the worshipers were the chief rabbis of Israel, Rabbi Yona Metzger and Rabbi Shlomo Amar, the rabbi of the Western Wall, Rabbi Shmuel Rabinowitz, interior minister and deputy prime minister, Rabbi Eli Yishai, the mayor of Jerusalem, Mr. Nir Barkat, Knesset Speaker Reuven Rivlin, Major General Yochanan Danino, the Commissioner of the Israel Police, Mr. Oded Winer, general director of the Israeli Chief Rabbinate and many Jews who came to celebrate the holiday in Jerusalem. 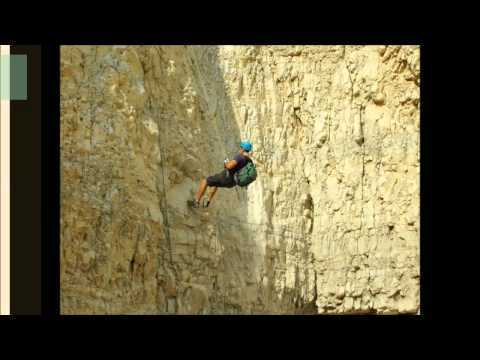 rappelling 30 meter (90 feet) in the north. full day hike in the north. the hike is excursion for experienced travelers. need to cross 5 pool deep. 3 Waterfall in the black canyon. in pesach is the best time to make the hike.when out side very warm you can enjoy from the cold water that coming from the hermon. 25 meter rapplling in the nort,nice place. Among these caves are “bell caves” which are former quarries. The caves are a network of underground connected dome shapes caverns with a hole in the center at the surface level. They were dug during the Roman, Byzantine, and early Arab periods. (3rd-10th century CE). Note the shape of the structurally sound dome and the chisel markings on the walls. At times, adventure companies come here offering rappelling into the caves. Since there are many “holes” in the ceiling you must be VERY careful when you are up on top. Amidst the yellow-brown of Judea Desert there is a flowing stream of water that disrupts with its blue, turquoise and green the monotony of the desert. This is Nahal Prat, a perennial stream and a touristic attraction. It is the ultimate trail that Nature can offer, an opportunity to meet with an ancient monastery, some secluded monks, and their hewed hermitage on its cliffs. When considering what life in such a paradise can offer one can understand why to leave everything in favor of a hermitage and different way to approach life: the Prat Stream can really bring peace onto every one. Jerusalem is home to a great many family-owned working-class Middle Eastern meat restaurants, particularly in the area around Agrippas Street and the Machane Yehuda market, which is crammed with Iraqi/Kurdish culinary establishments. Some of these working-class Middle Eastern restaurants have achieved a near-legendary status in the Jerusalem dining scene. King of the Iraqi/Kurdish lunchtime joints is Mordoch, a family affair on the corner of Agrippas and H’armonim streets only a few short feet away from Machane Yehuda. Enter and you’ll see rows of enormous pots, two or three deep, all filled with simmering Middle Eastern delicacies. B’nai Mitzvah festivities typically include a seudat mitzvah a celebratory meal with family, friends, and members of the community. Others may celebrate in different ways such as taking the bar mitzvah on a special trip or organizing some special event in the celebrant’s honor. In many communities, the celebrant is given a certificate. The main idea according to the Orthodox view is that this boy or girl is so happy that they are now commanded to do mitzvah and now they will earn reward in the next world for their efforts, that they throw a party and have a festive meal. Elana Dascal is a licensed tour guide in Israel for over 12 years. She immigrated to Israel from Canada after completing her BA and MA at McGill University in Jewish and Art History with a speciality in Bible. Combining her passion for learning about Israel and her Jewish heritage with her love for travel she took a two year course to become a licensed tour guide in Israel. Her proven technique and custom tailored itineraries for individuals and families from around the world move away from the traditional “checklist” of sites and instead include the physical, spiritual, intellectual, and creative elements to travel. challenge tours inviting you for a great activity in jerusalem for your family. Nahal arugot is one of the few streams in the Judean desert where spring water throughout the year, one of the world’s elaborate special nature, a mix of bare desert and warm fresh water has created here a unique desert Nath. This rare fauna and flora reserve world. Length of track: 2 to 6 km!Trip duration: 1-5 hours. Solo Dead Sea Beach Road (Hwy 90) opposite Ein Gedi Beach face by signposting to arugot, between palm groves to the parking lot. Here begins and ends itinerary. you plane to come to israel? challenge tours will help you to make the visit in israel interesting.